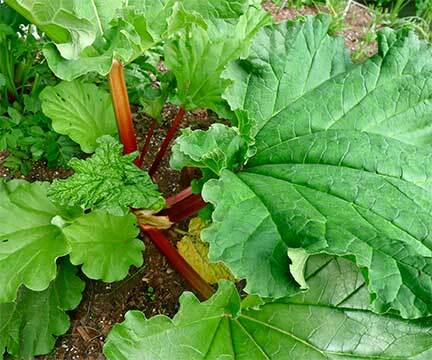 Rhubarb in Spring Garden. Looking at deeply etched leaves, it’s clear why Israelis call rhubarb the only self-watering desert plant. http://www.sciencedaily.com/releases/2009/07/090701102904.htm Photograph by Laurie Constantino. Maybe. Apocolypse or no, the garden is coming into its own and its bounty must be used. We’ve had a bumper crop of gorgeous red rhubarb. I want to turn it into something cold enough to get my mind off bugs and heat. I want tart, juicy sorbet. 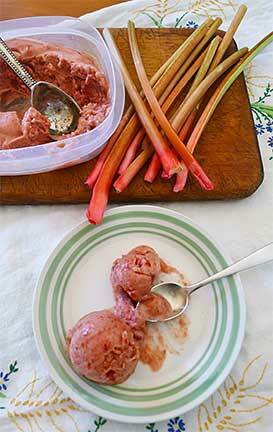 I decided to kill two birds at once: harvest rhubarb and make something delicious to eat. 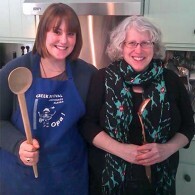 Occasional pastry chef Anna Thomas came yesterday to cook with me. I put her in charge of making sorbet while I worked on Thai Carrot Rhubarb Soup. When I discovered we were completely out of granulated, I offered Anna a choice between white and raw crystallized sugars. She cleverly chose raw turbinado sugar to help mellow rhubarb’s tart bite. It added a layer of flavor that white sugar couldn’t; lucky my pantry wasn’t fully stocked yesterday. For even more flavor we added crystallized ginger. It’s spiciness prevents the sorbet from being too sweet. Creating two great recipes is my idea of an excellent day (Thai Carrot Rhubarb Soup is also a winner). 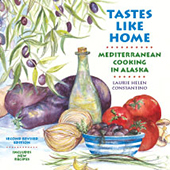 Actually it’s three great recipes: directions for making fab Grilled Halibut with Pineapple Salsa will be posted soon. Summer! Cold soup! Fish with salsa! Refreshing sorbet! This is the life.